Philadelphia – As he pulled the covering to unveil the newly named Whitaker Avenue – about to become known as “Borinqueneers Avenue,” Friday, Pennsylvania Rep. Angel Cruz and the rest of an audience of some two hundred Latino community leaders, public officials police officers and firefighters, were startled as a portion of the plastic cover still clung to the sign, leaving hidden the new name. After a few hushed and anxious moments passed, the expectant audience burst into applause as a gust of wind hoisted the remaining cover straight-up, as if into clouds. For a historic 65th Infantry Regiment that had participated in World Wars I and II, and had adopted the nickname “Borinqueneers” during their transit to fight in the Korean War, the temporary delay seemed emblematic of a group of Puerto Rican soldiers who similarly remained hidden in obscurity for generations. Mr. Perez then recalled the national effort to obtain the Congressional Gold Medal that was spearheaded by Latin-American Legion Post 840’s Commander and ( Police Inspector) Joe Melendez (Army Veteran, Vietnam); USMC Juvencio Gonzalez, an aide to Lt. Governor-elect Mike Stack and himself: “We started this and we never thought it would get this big,” said Mr. Perez of the pursuit of gold medal legislation (H.R. 1726) that passed on May 22nd of this year. 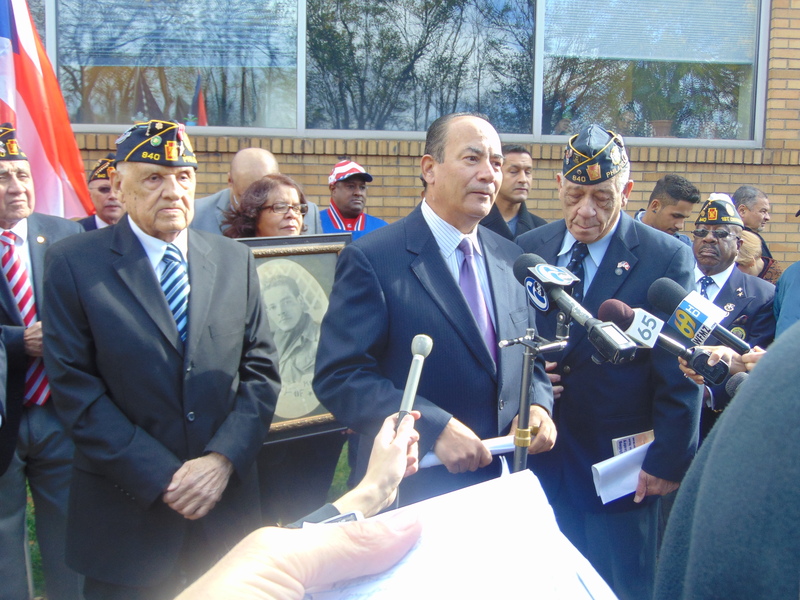 “It was our responsibility to make sure the “Borinqueneers” were recognized and respected,” said Pa. Rep. Cruz, who followed by introducing two of the remaining members of the Puerto Rican 65th Infantry, Hector Maisonave and Emerito Bermudez. “They gave us the freedom we enjoy today,” added Rep. Cruz. Noting that this is the “Year of the Veteran,” Mr. Gonzalez lauded the more than three hundred members of Congress and 67 Senators, and specifically U.S. Rep. Brady, Senators Bob Casey and Pat Toomey, Lt. Governor-elect Mike Stack, State Rep. Angel Cruz, City Councilwoman Maria Quinones Sanchez, who have made this such a “wonderful year” for Borinqueneers. “We also want to see documentaries, films, monuments and curriculums where they teach the history of the 65th Infantry,” said Mr. Gonzalez. “So when you hear about the Tuskegee Airmen, when you hear about the Navajo Code Talkers, you’re going to hear one more, the 65th Infantry Regiment,” asserted Mr. Gonzalez to applause. “This is Boricua, this is our culture,” said a delighted Dinorah Diaz of APM, a leading Latino community-based organization. “The 65th fought in some of the key battles of the Korean war, a like Outpost Kelly and Jackson Heights,” added Mr. Santiago, battles where they often (outnumbered) by the Chinese and Korean enemy soldiers. The Congressional Gold Medal is being produced by the 65thCGMTeam.com and directed by Sam Rodriguez. Avenue of Borinqueneers// Honor for Puerto Rico's Historic 65th Infantry.